Where is the next cinema? Are there any pubs and restaurants near by? Where can I find the nearest points of interest? With the help of an iPhone you can answer such questions yourself within seconds. 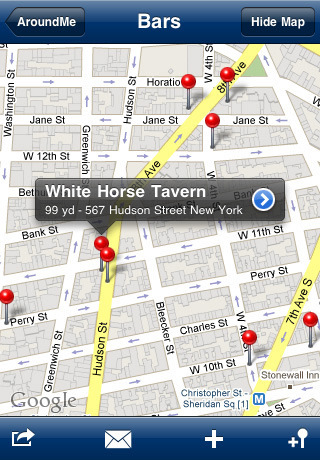 GPS and permanent Internet access allow you to find shops, drugstores and hotels easily. Location Based Services are considered as the next important trend in the mobile sector. Thanks to the free application AroundMe nobody needs to feel like a stranger in a foreign city anymore. The idea is so simple as effective: Through GPS and Wifi AroundMe finds the current location of the device and then offers a list with information so that ATMs, parking lots and gas stations can be displayed quickly. As AroundMe also integrated Google Maps it is possible to show the desired destination on a map. The individual database entries often possess also telephone number, email address and website, which can be clicked on directly. Furthermore it is possible to get directions via Google Maps. Also a weather forecast by WeatherPro for the next 3 days is integrated. Users of social networks are able to publish their search results on Twitter or Facebook. In addition to that this application allows you to send a link via email or to add the information directly to the contact list. AroundMe has been developed by Tweakersoft and launched in September 2008 and still can be downloaded at the AppStore. 6 months later this application was downloaded already 5 million times. AroundMe is available in English, German, French, Spanish, Italian and Japanese. 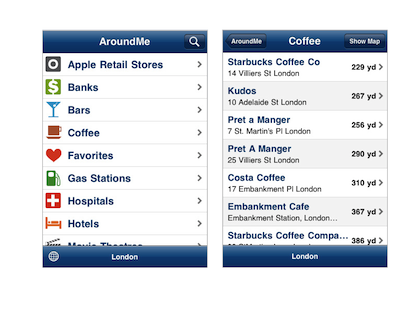 AroundMe is compatible with any iPhone or iPodtouch which runs at least the 2.2 software update. Devices older than iPhone 3g and iPod Touch only work with Wifi and due to this the usage of this application is limited. The Compass display function requires at least an iPhone 3gs device. This application with the same features is also available for Android devices. The newest version of AroundMe was released on September 14th 2011. This update now allows support for external navigation apps like Navigon MobileNavigator, TomTom and MotionX-GPS Drive. The interface of AroundMe is designed very simple so that desired destinations can be found just with a few clicks. AroundMe also offers a clearly arranged Google Maps interface, The search results of Google Maps in a certain sector are similar to them of AroundMe. It is also possible to find certain destination and places whilst being somewhere else. The function to type in a zip code allows users even to plan a trip with this application. Moreover the categories of this application are not limited so that it is possible to search for certain keywords which do not fall in a category. A disadvantage is that AroundMe shows advertising on the top of the search results. However Tweakersoft offers an upgrade with costs which is free of ads. Furthermore it is not possible to save certain search results offline in order to retrieve information without beeing connected to the Internet. The only possibility remaining then for users is taking screenshots of the displayed search results. AroundMe works without restrictions only by having GPS and 3G to guarantee a reliable search result outside of urban areas. This application also collects data like category, country and city of the search result, model of the device and current software from their users in order to make decisions on the further development. This data is collected anonymously and can also be switched off in the settings. Actually, Apple could have integrated such an application from the very first as the iPhone is literally made for this. In a nutshell: scanning the nearby area uncomplicated and free of charge for information with just a few clicks – AroundMe is definitely worth being downloaded. « Mobile Application Review: Grindr. It’s a guy thing.